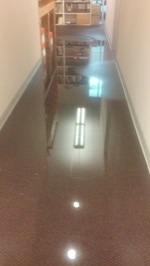 Due to a major water leak, our offices are closed. We won't be able to ship W23 orders until we reopen; it will be a few days. Sorry for the inconvenience! We took only about an inch of water in most places, so this is not as much a disaster as it is a horrible, horrible nuisance. Contacting us via email may be spotty tomorrow because the cleanup crews will be working in the server room during the day. More news is coming, as we hear it. Edit: tomorrow the folks cleaning up the mess are going to need to work in our server room. The website and the Daily Illuminator should be fine, but it's going to interfere with our email server, so we'll be hard to contact via email tomorrow. We're not sure how long, but we'll keep you updated. Twitter is the best place to go for updates; our username is @SJGames.